Are you still worried about choosing a gift for your children? Then this fashionable shaped music box through exquisite workmanship is a good choice. With excellent quality, simple and elegant design, it can be used as an ideal decoration in the living room or on the coffee table. It is a great gift whether for others or yourself. By virtue of its easy operation and pleasant audiovisual effect, it is a music box that you are not willing to put down. 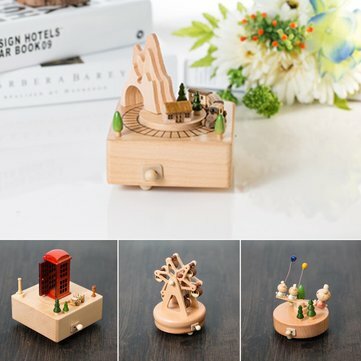 -Featuring simple and elegant design with changeable scenes, it can help you look back on your childhood. -High quality wood material is used to ensure a lightweight product which can be freely placed. -Classic light music can be used as a lullaby to make your children have a sound sleep. -Without burr, it is non-toxic and more durable due to its high quality material.